During my time at the Once Upon water residency on Pico Island I intend to continue to explore imagery informed by the ever changing nature of the edges of islands, the intertidal zone. I plan to work with water based media on large sheets of Yupo paper that can be developed into a sequential panorama that will reflect the unique nature of water in the Azores. These paintings will become part of my ongoing series: The Edge- Ancient Light. I look forward to experiencing the people and edges of Pico as well as the variety of programming being offered during the residency. My work in the visual arts is in the mediums of painting, printmaking and photography. With all of these mediums I have explored changing states, atmospheric layers and the phases of water – solid, liquid and vapour. These concerns are particularly evident in my painting series Ancient Light, Phasing- The Liquid art of Unlocking and The Veil Between. My deep curiosity and affinity to islands began more than 20 years ago during a trip to Greenland. Since that time visits to New Zealand, Ireland, The Arran Islands, Haida Gwaii, the Caribbean, Greece, and the Canadian Gulf islands where I now make my home, have fundamentally influenced my work. In March of 2015 I attended an artist residency at NZPS, New Zealand Pacific Studios. This residency was an extremely rewarding experience, which is one of the reasons that I am so intrigued by the potential of the Once Upon Water residency. When I came to the New Zealand residency I had an idea that I wanted to explore imagery that was engaged with intertidal zones. I had no preconception at that time as to how this might develop. I brought with me to that residency a poem by Gabriola author K.Louise Vincent and an essay “An Island’s Edges” by Gerald Hodge of Hornby Island. During this residency a new technique and a narrative way of approaching the subject matter emerged. The first 12 pieces of the Ancient Light series were substantially completed there. The series has now grown to more than 40 works and will also form part of a planned collaborative book with a lyric essay by K. Louise Vincent. I began working on Ancient Light on small 9” X 12” sheets of Yupo paper. I am now working on larger 40” x 26” sheets. It is in this larger format that I plan to continue working on the shores of Pico Island. Karen Curry is a Canadian visual artist working in the mediums of painting, printmaking, and photography. 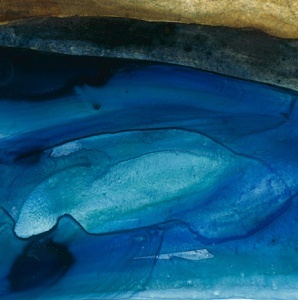 A Toronto based artist for more than 20 years, since 2009 Curry has based her home and studio on Gabriola Island, BC. She continues to spend part of each year in Toronto and to be involved with Open Studio. Born in Yellowknife, Curry obtained her BFA at the University of Alberta and continued her studies at the Accademia Caerite, Italy and The Sun Valley Center for the Humanities, Idaho. She has exhibited widely in solo and group shows, nationally and internationally. Her work is held in numerous public, corporate and private collections. Collections include Burnaby Art Gallery, Department of Foreign Affairs, The Donovan Collection, Ernst and Young, Falconbridge Canada, Palm Springs Museum, Royal Bank, The Investment Funds Institute of Canada, University of Alberta, Vancouver Art Gallery, Art Gallery of NSW, Sydney, Australia, National Gallery, Canberra, Australia.